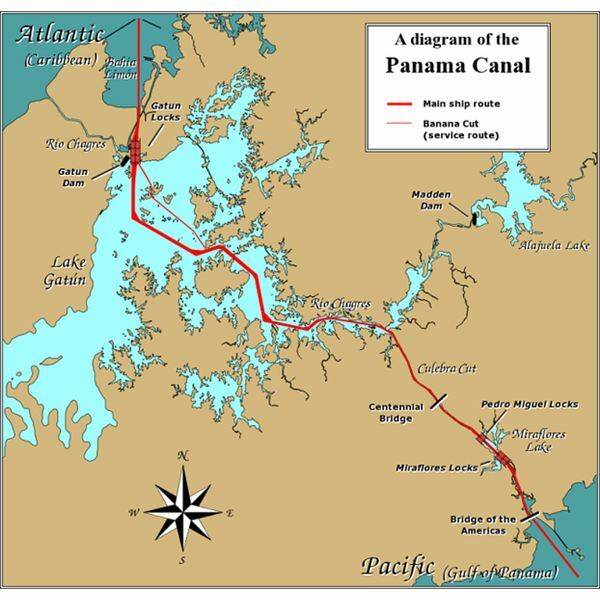 The Panama Canal connects the Atlantic and Pacific oceans and is a 48 mile canal that connects these two oceans at a point in Panama that constitutes the shortest distance between the two. When it was completed in 1914 after ten years of work, it was considered a huge engineering feat that helped to cut the distance travelled by about 8000 miles, as previous ships had to go around Cape Horn in South America to change oceans. The canal consists of two artificial lakes and three sets of locks each of which takes ships up or down in single or two or three stages that help the ships to climb a height of about 85 feet and then descend again to sea level. Water required for the locks is obtained from the inland artificial lakes, and each ship movement requires about 53 million gallons. As there are over 14,000 movements of ships every year, the amount of freshwater that ultimately joins the sea is a fairly substantial amount that can have an effect on the marine life in each of the oceans. Attempts have been made to reduce the amount of water being used by building water saving basins besides each lock. This would reduce the requirement of water from the lakes, but will in no way change the amount of water that does mingle with the oceans when the ships are again brought down to sea level in both oceans. This quantity of water may even go up as new sets of locks are being built, which would increase the number of ships transiting the canal. Additional fresh water comes from ballast used by ships to maintain specified drafts for movement in the canal. This water is then discharged into the oceans after the crossing is complete. 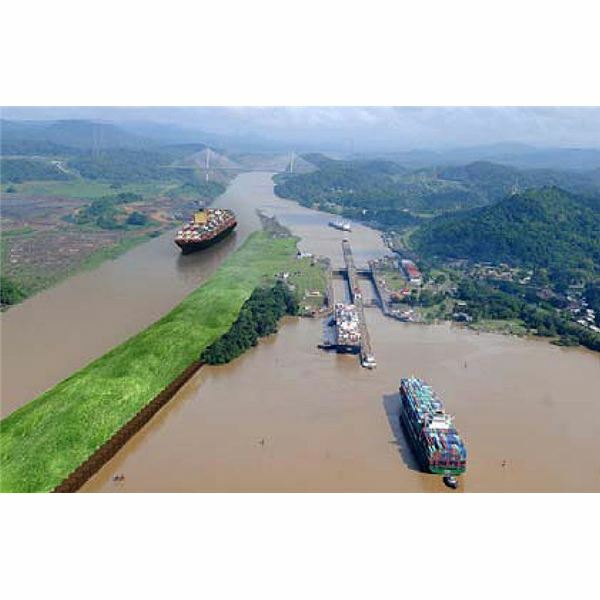 The locks of the Panama Canal are not an obstacle to the movement of marine life. Several fish species which migrate from saltwater to freshwater are easily allowed to do so through the vast amount of freshwater that goes into the oceans on either side of the canal. This also means that species from the two oceans can use this canal to migrate between oceans. The freshwater from the canal locks lead to some mixing of the waters. Helped by the fact that the density of freshwater is less than seawater, current movements are set up in the water which lead to further mixing and cause the waters further up the canal to turn brackish. This can have an effect on marine life used to fresh water, and such fish, as a result, generally avoid the locks. However a number of salt water species of fish have been noticed in the two lakes at Miraflores and Gatun, which are the sources of freshwater for use in the locks. Hydraulic conditions in the Panama Canal ensure that canal water or freshwater is always higher than the sea level. The higher flow velocities caused by these level differences causes a stronger turbulence that helps to mix the freshwater and seawater and in a way that inhibits the amount of seawater intrusion, which is a normal phenomenon in most sea estuaries where water flowing in does so at lower velocities. The water in the regions of the freshwater inlets from the Panama Canal locks is brackish and has a salinity that allows certain aquatic plants and fish varieties to prosper. Because of the higher flow velocities of water from the canal, the area affected by these changed conditions extends for quite a distance into the oceans on both sides of the canal. Freshwater carries a lot of nutrients and microorganisms in the water. This, and the sediment that it carries, lead to a wider variety of marine and other life depending on these organisms.